We don’t have to tell you how tough it is to buy your own home. Stagnant wages, mountainous student debt, insane home prices that have reached record highs – the American Dream we were all raised on may seem more like an American Horror Story today. Yes, it’s bad out there. No, it’s not your fault. You’re facing an entirely different economic landscape than 40 years ago. Even 20. Adjusting for inflation, today’s average real wages have roughly the same purchasing power as they did 40 years ago. Only half of today’s 30-year-olds earn more than their parents. 83% of non-homeowners cite student loan debt as the main reason they can’t buy a home. Frankly, it’s unreasonable to expect that anyone – especially millennials, now the largest age demographic in the U.S. – can buy a home the same way their parents and grandparents did. How can you possibly be expected to put a down payment on even the least-expensive home when in many places it takes two decades and more simply to save up for one? The answer is that you can’t use an old way of thinking to tackle an unprecedented problem. Difficult circumstances require inventive solutions. And now, there’s a whole new way to finance a home that can make the American Dream a reality. Take a look at the happy, blissful couple at the top of this page. Imagine with us that they just moved into their dream home. They worked hard, just like you. They saved, just like you. In this scenario, they were able to make a down payment on a home in the perfect neighborhood. How does a couple like that get the home of their dreams with so many factors working against them? … with a home co-investment. 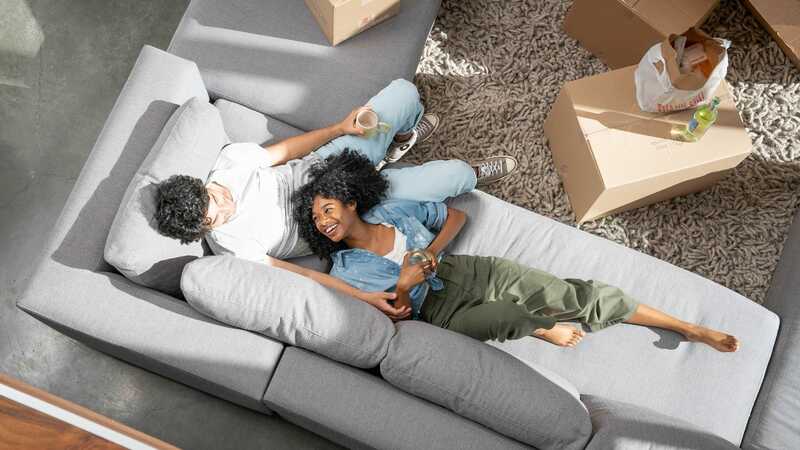 Like this fantasy couple, you can dramatically increase your purchasing power by trusting and partnering with Unison to bypass the obstacles of a traditional home loan. Home co-investing may sound new to you, but we’ve been doing this a long time. In fact, we invented the category back in 2006, and it’s being used more and more by those who have long dreamed of buying a home but couldn’t until we became partners. In this video, Trevor and Lindsay of San Diego County represent just one couple among thousands of satisfied homeowners whom we’ve helped to buy their dream home. Now, picture yourself on that sofa. It can be your dream, too. Learn more about how to put down a smaller down payment and not pay for mortgage insurance.